Layout, privacy even though neighbors are close by, cleanliness, felt immediately comfortable and cared for. Fantastic stay! The house is in a great location and has ocean views; it was great just sitting out on the balcony and listening to the surf. The vaulted ceiling in the living room made the house feel roomy, too. I just wish we had been able to get into the loft! 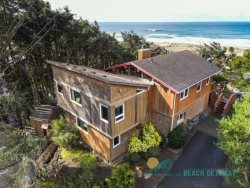 The Manzanita Beach Getaway team is super! Information is provided quickly and accurately and everyone is friendly and focused on providing the best experience. We absolutely loved our stay at Sandslot!!! The accommodations were very comfortable and I think the best of the various places where I've stayed in Manzanita. The kitchen was a dream to work in and we loved the open living area for games and puzzles. Everything was clean, orderly and well supplied. The easy access to the beach is great for kids and grandparents! We hope to return...though it would be tough to top our wonderful experience as the weather was perfect, too. Everything about the property was tiptop....immaculate, great location, great furnishings, etc. We were very happy there. The week before the trip I realized I had not received an email regarding check-in information about the house so I emailed to request the info to be sent. I must have lost the initial email to my trash folder as I never found it, however, my request for a second one was answered very promptly and courteously. I was very pleased. Everything was exceptional and the house was extremely clean and welcoming. My family and I loved all the personal touches that you don't often see in a rental, such as the beautiful stone patios and very well stocked information binder as to local hikes and restaurants, etc. The whole experience made us feel very comfortable, and we hope to come and stay again! Features! I loved the stone patios in the front and back of the house, the upstairs bathtub was luxurious, the beds were extremely comfortable and clean, the kitchen was very well stocked, and the overall cleanliness of the house was exceptional. Very comfortable, and well thought out for guests. We forgot an item. Your staff promptly called and let us know. They were great to work out the details of getting it returned. We loved the house and were impressed with how well stocked it was. The team was very friendly and responded quickly to our needs. We had a very pleasant stay, despite some medical complications along the way.The team was very responsive, and the house was just the right size for our group.